I like to dabble with models. I have modeled specific cars, and specific trains. When I am working with die cast parts, or need to make a part I often use JB Weld. Recently, our past VAE president and Wheel Tracks editor Gene Fodor was fortunate enough to find a nice, well used and mostly complete model MG TD (pictured below). Gene decided to restore the model, and model it after his 1953 MG, affectionately named Eliot. “Little Eliot” was missing the spare tire, the dashboard decal, and the steering wheel. Gene was able to locate a replacement spare tire and dash decal, but no steering wheel. These steering wheels were a very soft, high lead metal. They were easily broken, as the spokes in the wheel are quite thin. I took it upon myself to create a new steering wheel for Gene and little Eliot. First, I borrowed a similar model to use as a mold for the wheel. I carefully made a relief mold of silly putty, and filled the mold with JB Weld. Second, I carefully pealed the silly putty off and cut off the casting slag. Third, I took a piece of coat hanger for the steering shaft, hammered a flat on the end, and made a mold for the back side of the wheel. I carefully placed the coat hanger wire in the mold and poured JB Weld in to the mold. The final step was to bend the correct bends in to the shaft, and file and sand the wheel to the proper shape. I have used similar techniques to alter both model trains and cars to copy specific prototypes. Gene has done a fantastic job with the restoration of little Eliot. 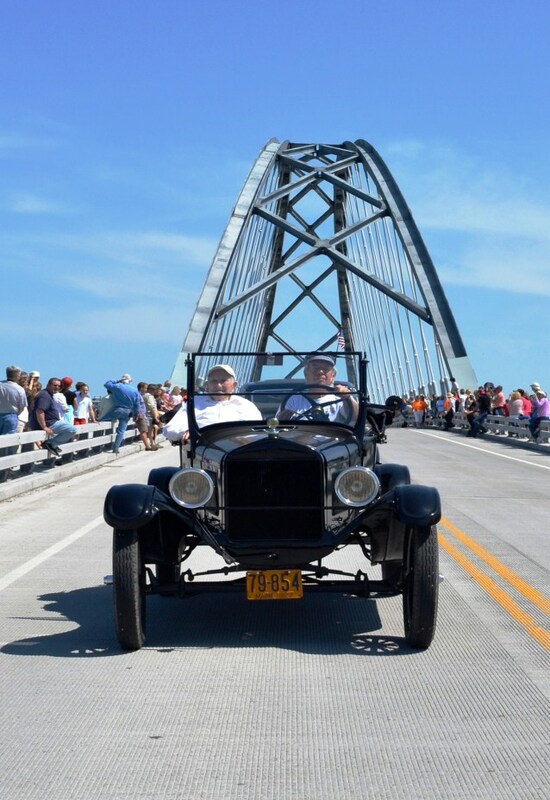 From Granddaughter Kris Trombley… ”My grandmother, Ida Wolcott Wendell, was 15 years old when she attended the Crown Point bridge opening in 1929. She has many memories of the day including having a picnic with her family. She remembers watching the parade at the foot of the bridge on the New York side and remembers seeing, then Gov. Roosevelt in the parade. She also recalls seeing soldiers and scouts in the parade. My grandmother grew up in Crown Point, NY and later moved to Ticonderoga. She married Thomas Wendell. They were married for 72 years before he passed away in 2006. My grandmother was a seamstress. Long before the first Crown Point bridge opened, her grandfather, ran the sail ferry transporting passengers between NY and VT. 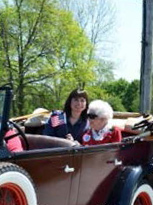 I felt very proud and honored to spend the day with my grandmother as we rode in the parade celebrating the opening of the new Crown Point bridge. Thank you so much. From Gary Fiske… I got lucky at the Bridge Celebration. Bill James of Bristol, VT. agreed to ride with me. I was able to learn just a little of this gentle-man’s 100 years and because of this I will remember him for the rest of my time. Bill will be 101 years old this July. He drives his pickup and Buick where he needs to go, in fact he told me he would be changing the oil in his Buick on Monday… himself! Bill told me while the 1929 bridge was being built he would come by after hours and walk the board cat-walks between the girders to get a close-up view. That is when he found he had no problems with heights and later spent his career as a lineman for the CVPS power company. Bill lost his wife of many years not long ago but has a daughter that he lovingly says ’bosses’ him around and watches over him. This was Bill’s first ride in a Model T. I am not great in crowds but Bill is a natural, waving and smiling to everyone. Bill James made my day. From Wendell Noble… “Our participation in the Champlain Bridge celebration was a great experience for all of us. We wanted to get as many ‘20s vintage cars there as possible to contribute to the historic educational content of the event. Sometime during preparation I realized that my contribution would not be limited by the number of my cars, but finding people to drive them. By enlisting friends and neighbors, I got three cars successfully down and back. A wonderful couple of ‘29ers rode across the bridge in the back seat of my ’29 Plymouth touring car. The front passenger seat was empty though. My wife Mary was nowhere to be found. She had chosen to go up-scale and ride with Christina and Paul McCaffrey in their Bentley. For Lew Zeno, driving my ’29 Plymouth roadster, there were no ‘29ers left so he had a kilted bag piper riding in the rumble seat. Clark Wright did just fine with my ’28 Dodge Bros Coupe until the next day when it succumbed to vapor lock. On our way across the bridge, I heard one spectator say, “That’s amazing, none of them have broken down yet.” I scolded him for such talk.